To create the political groups used for analysis in this report, survey respondents were categorized into seven groups based on their left-right ideological self-placement and whether they express populist views. The six political groups are Left Populists, Left Mainstream, Center Populists, Center Mainstream, Right Populists and Right Mainstream. The seventh is the Unaligned group, which includes respondents who did not answer the ideological self-placement question. 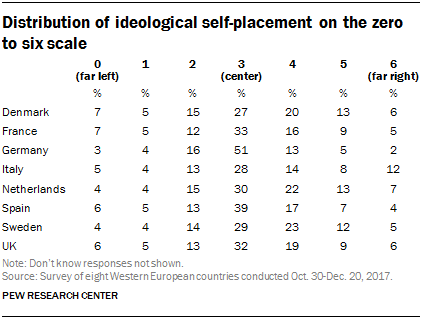 Respondents were asked to place themselves on a zero to six ideological scale ranging from far left (zero) to far right (six). Respondents who place themselves at a zero, one or two are categorized as “left,” those who place themselves at a three are categorized as “center” and those who place themselves at a four, five or six are categorized as “right.” Those who did not answer the ideological self-placement question are placed in the Unaligned group. The center group is restricted to just category three – rather than combining categories two, three and four – for two reasons. First, a large percentage of respondents in each country place themselves in category three. If the categories two, three and four were combined into the center group, this would leave very few people on the left and the right for analysis. Second, and more importantly, on most key issues included in this report, there are significant differences between the people who place themselves at “center left” (two) and people who place themselves at “center right” (four). In fact, the attitudes of those who are center left (two) are closer to those on the far left (zero or one) than they are to those who are center right (four) and vice versa on the right. For example, take the issue of whether it is the government’s responsibility to ensure a decent standard of living for all. In Denmark, 72% of the far left hold this position, as do 69% of the center left. In contrast, 44% of the center right espouse that view, along with only 35% of the far right. It is also important to note that the ideology measure is not specific to any particular issue area. While left-right terminology in Europe has typically been used in the context of economic issues and the role of the state in the economy, this self-placement ideological scale captures political differences on a range of issues – economic, social and immigration – as shown throughout the report. To evaluate the impact of populist views, the survey focused on measuring core components of populism. Academic studies of populism consistently identify a few key ideas as underlying the concept: 1) The people’s will is the main source of government legitimacy, 2) “The people” and “the elite” are two homogenous and antagonistic groups, and 3) “The people” are good, while “the elite” are corrupt (Stanley, 2011; Akkerman, Mudde, & Zaslove, 2014; Schulz et al., 2017). The measure of populist views used in this survey is based on respondents’ answers to two questions: 1) Ordinary people would do a better job/do no better solving the country’s problems than elected officials and 2) Most elected officials care/don’t care what people like me think. Both measures are meant to capture the core ideas that the government should reflect the will of “the people” and that “elites” are an antagonistic group that is out of touch with the demands of “the people.” The second measure is also a traditional question asked regularly over time on political surveys to measure efficacy and dissatisfaction with government responsiveness. This measure, or ones that are similar, are used by scholars studying populism to capture attitudes about an antagonistic relationship between elites and the people (Stanley, 2011; Spruyt et al., 2016; Schulz et al., 2017). Spearman correlations for the two questions measuring populist views combined fall between 0.2 and 0.3 across countries. Due to the limitations imposed by conducting a survey on a broad range of issues and keeping the survey to a reasonable length for respondents, we focused on just these two key questions to measure populist views. Many scholars rely on multiple questions to measure populist views. The two measures we use are essentially a measure of anti-establishment attitudes. While this is a key aspect of populism, it can also be a broader concept than the narrower idea of populism. Given that, the populist groups studied here may include some people who do not consider themselves populist or populist supporters, while the mainstream group may include some people who do. Still, as is shown in the analysis, the two groups studied – populist and mainstream – reveal consistent, distinct attitudinal patterns across a range of questions.